During the negotiations between Canada and the Hudson's Bay Company over the transfer of Rupert's Land, no one had bothered to consult the Indigenous and mixed-blood people who inhabited the area. Before the official transfer had even taken place, surveyors began moving in to divide up the land into agricultural sections. This alarmed the Métis who saw their traditional hunting grounds being taken over. They rallied around a 25-year-old, Montreal-educated, bilingual leader, Louis Riel. Riel formed a provisional government and began drafting a list of rights which laid out the Métis conditions for joining Canada. Although known as the Red River, or Riel "Rebellion" some historians now call these events more of a "resistance" since Riel pledged allegiance to the Queen and was not out to overthrow anyone. 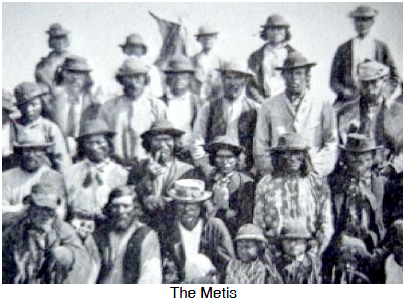 The Métis simply wanted their rights respected and their way of life protected. When the newly appointed lieutenant-governor of the Northwest, William McDougall, arrived prematurely to claim Canadian ownership of the area before the actual transfer from the Hudson's Bay Company had taken place, Riel and his followers moved to stop him and took over Fort Garry near what is now Winnipeg. Sir John A. Macdonald chose to meet the resistance with negotiation rather than arms for mostly practical, rather than humanitarian, reasons. He called Bishop Alexandre Taché, who had worked in the region for a number of years, back from a Vatican Council to talk to the Métis along with the HBC's Donald Smith. It was agreed that the Métis List of Rights would be used as a basis for negotiation with the Canadian government and a Métis delegation was sent to Ottawa. Meanwhile, agitators against the Métis were planning a counterattack on Fort Garry. This was a group called the Canadian Party, led by John Schultz. They wanted to claim these good farm lands for Canada West. A number of their followers were arrested by Riel, including a mouthy young Irish Protestant named Thomas Scott. Provoked by Scott's taunts, Riel made the major mistake of having him executed after a brief trial by a Métis court. This made Scott into a martyr for the anti-Catholic Orangemen of Ontario and fanned the flames of French/ English conflict in the young country. It also discredited much of the good work Riel had done and eventually led to his own execution 15 years later.